Description: Inspired by Biltong, the South African beef snack, ByBenji Training Treats are high quality, natural dog treats, made from pure beef, dry cured in England. DEFRA approved. Why did you agree to review this product? We were given a sample of the training treats to review as we have three dogs, two of whom are known to struggle with focus. Tell us a bit about your experience with this product? As we do agility and flyball, we are following a strict training regime where the dogs' food is given to them as part of a training exercise or game. No food given in a bowl. We used the ByBenji training treats as a high value reward in recall and distraction training with excellent results. The treats were given when the dogs saw a distraction such as a cat. For this to be effective it has to be really high value. The Biltong really fitted the bill. 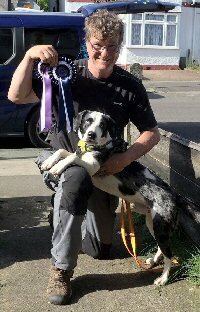 Who knows... Maybe it even helped Adrian to get two 1st places with Galilea and a 2nd and a 6th with Kibulu at the BATS Agility Show. The dogs loved it and we loved how it smelled. 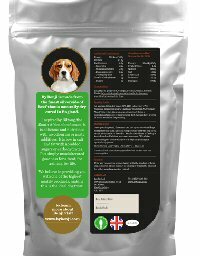 As we raw feed for the dogs' main meals, we are careful about what treats we use - this fits the bill perfectly. We were especially pleased that it doesn't contain sugar. It was also really easy to break into smaller bits for training. The text could be bigger on the back of the package. Packaging: We really liked the packaging, a great quality product all round. Instructions: Instructions were easy to follow - as long you can see them. I read them, but my husband didn’t. He found the text too small. Value for money: To be honest, at £72 a kilo, it is a bit pricey. While we loved it, we’d probably use our own dehydrated treats as they have similar results and are obviously a lot cheaper. We do, however, acknowledge that the two are not the same. 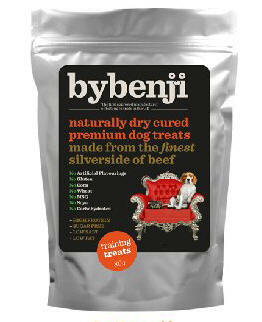 ByBenji Biltong Training Treats are made of pure, air-cure silverside of beef. Comparable dehydrated treats can be found for sale, costing in excess of £100 a kilo for chicken or liver. Overall rating: 10/10 because we loved it and the dogs loved it, too. Would you recommend this product to your friends and family? Yes, it could very well have been the deciding factor in getting our dogs their first points towards KC Grade 2. Helen and Adrian Miller are a dog owning couple with two terriers and a sprollie. 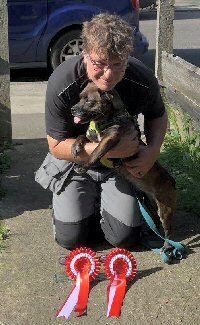 They are active family - two dogs do agility and flyball - and they committed to 24/7 training and lifelong learning. Helen and Adrian live in Harrow.